The Republican National Convention is this upcoming Monday through Thursday. 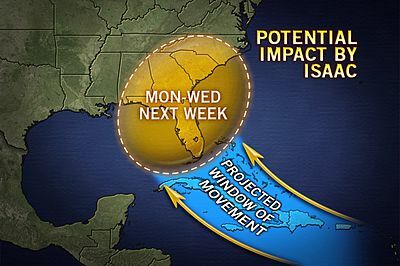 Amazingly, tropical storm Isaac, predicted to become a hurricane, will be hitting Florida Monday through Wednesday. Makes sense, too. Why would God hit the Democratic National Convention? They've already taken sides, but many in the GOP are on the fence yet quickly turning against Truth. Let this be a last-minute wake up call. Also, consider what happens if the Republican National Convention is severely impacted or even cancelled. What if the ultimate effect is Obama back in the White House, which only speeds up the events in the Middle East, rise of the antichrist, and the return of Our Lord. Is there any significance to the name of the hurricane: Isaac - Laughter? Isaac was the symbolic precursor to Christ. The covenant was with Abraham and his descendants. Isaac was sacrificed on Mount Moriah (Mount Calvary / Golgotha). This time Isaac came as a roaring Lion. Messiah will return as a roaring Lion. I believe He is warning us plenty of His imminent return.